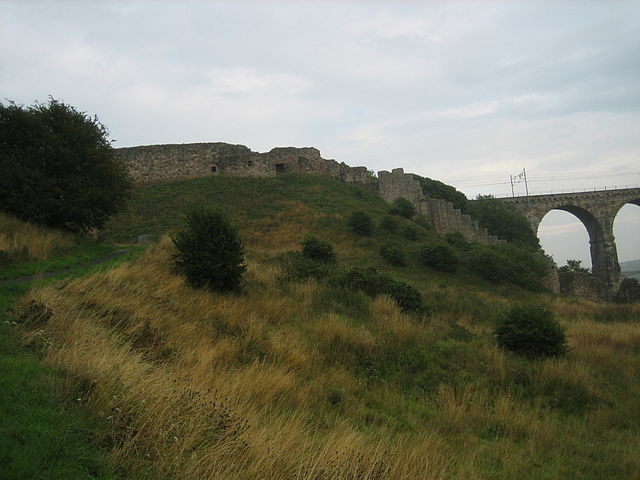 Notes: Berwick Castle is a ruined castle in Berwick-upon-Tweed, Northumberland, England. The castle was founded in the 12th century by the Scottish King David I. In 1296-8, the English King Edward I had the castle rebuilt and the town fortified, before it was returned to Scotland. In November 1292, King Edward announced in the Great Hall before the full parliament of England and many of the Nobility of Scotland his adjudication in favour of John Balliol of the dispute between him, Robert the Bruce and the count of Holland for the Crown of Scotland. 1330 "Domino Roberto de Lawedre" of The Bass, described as Custodian or Keeper of the Marches and the Castle of Berwick-upon-Tweed, received, apparently upon the termination of his employment there, 33.6s.8d, plus a similar amount, from the Scottish Exchequer. The town and castle changed hands several times during the English-Scottish conflicts.The castle's location in the hotly disputed border country between England and Scotland made it one of the most important strongholds in the British Isles, and it enjoyed an eventful history. As a major tactical objective in the region, the castle was captured by both the English and Scots on a number of occasions and frequently sustained substantial damage; Edward I used it as his headquarters during the course of his invasions of Scotland. The castle also changed hands in less violent circumstances when the English King Richard I sold the castle to the Scots, to help fund the Third Crusade. The castle finally fell into English hands in the last week of August 1482. After invading Scotland following a pact with the Duke of Albany, Richard, Duke of Gloucester captured the castle from Patrick Hepburn, Lord Hailes. The principal surviving part of the structure is the late thirteenth century White Wall and the steep and long flight of steps known as the Breakneck Stairs. It is now administered by English Heritage.